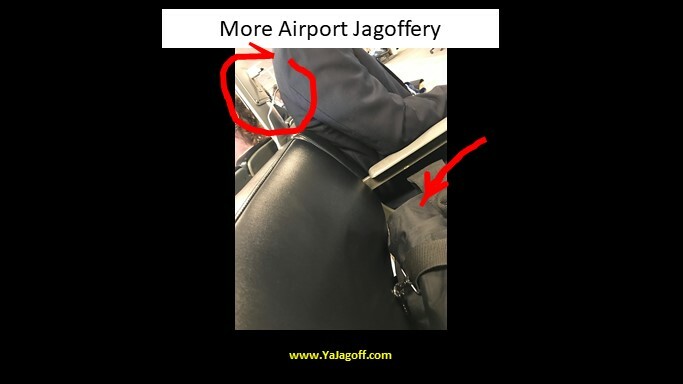 There never seems to be an end to Jagoffery at airports. It’s a place where self-importance runs rampant and awareness of other people tends to go down the drain as much as our hopes for a Pirate’s World Series. This guy…..wait…I have to explain airports these days before I talk about this guy. Airports have become a haven of people walking around, ducking, leaning, staring oddly..like they are on an urban safari looking to collect gum off the bottom of the seats at each gate. They are looking for the new Holy Grail… an outlet to plug in their smartphone/tablet/laptop. It’s insanity. OK, so back to THIS guy! Seats open all around him because it’s not a busy time at this particular gate. He sits right in front of one of the rare charging stations, puts his bag on the chair next to him, also in front of the rare charging station and he’s charging NOTHING! I guarantee he’s “that guy” that takes the last seat at a bar and never orders anything but ice water. The good news is, the smartphone plug that you can see in the photo is mine and, I bumped into his shoulders at least 3 times, on purpose, to let him know John was sitting next to him and that I was not happy. Sure! I get it, my childish actions were about as effective as high-beaming the car that cut you off on the Parkway but it made ME feel better! Hey Plug-and-NOT-Play-Pete (see what I just did there?) if you’re not gonna use the charging station, get the hell out-da-way! Would you walk up to the only open urinal at a busy Men’s Room and just stand there until your diuretic meds kick in? What are you the human version of a Pittsburgh Parking Plug Chair, YaJagoff? Previous articleWhat Does the Black Box Mean?